A Scourge of Bunny Rabbits? Stadspark (City Park) in Antwerp, Belgium, has bunnies like Central Park has squirrels. At first I didn’t believe a local who told me of the roaming rabbits, but they aren’t hard to find. In fact, they were hard to miss. 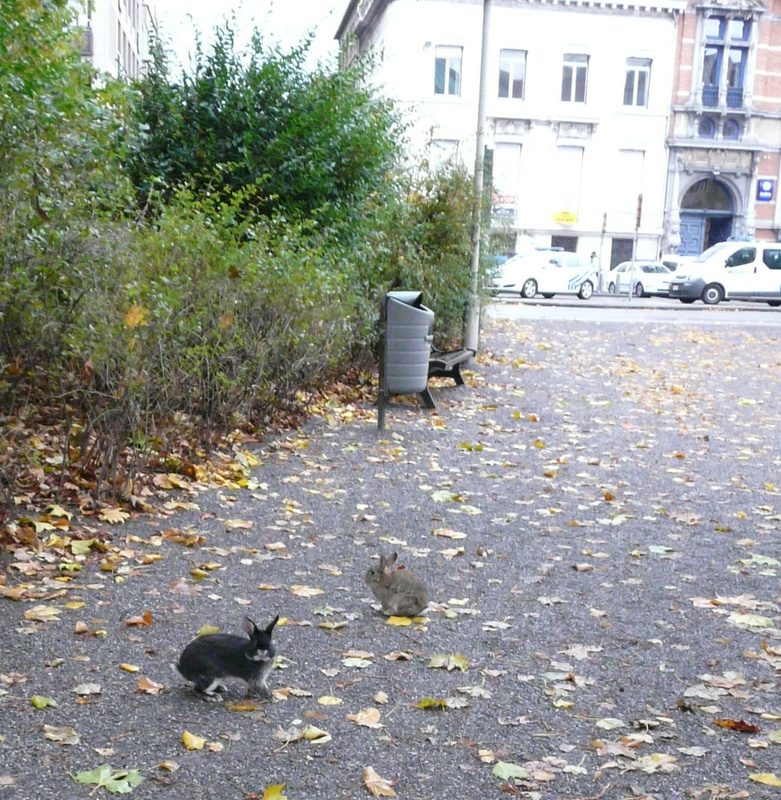 Black, white, multi-color rabbits that had clearly been released from careless pet owners, nonchalantly gathered in clusters and hopped across paths. Antwerp is not alone. It’s just one of many places around the world facing a surging rabbit population. Stockholm parks managers kill thousands of rabbits a year, so many that this year they decided to start burning them as fuel. England is worried of a rabbit surge. Even Mike Ballast, the composer who wrote theme song for the embattled rabbits of Watership Down, has been wiping out rabbits on his estate. In British Columbia, the town of Kelowna has been hunting bunnies with air rifles, but will now catch them and try to give them to rabbit rescue groups or neuter them like feral cats. What’s going on here? There are two kinds of rabbits: wild and dumped pets.Both groups are benefiting from some changes: in Europe 95% of rabbits were wiped out by the myxomatosis virus in the 1950s. But resistant rabbits thrived and over the decades the population came back to levels not seen in many people’s lifetimes. Some also think global warming lets them overwinter in places that were once inhospitable. And there’s the lack of natural predators. Or even unnatural predators, like unleashed dogs, which have vanished since the 1950s. The dumped pets generally can’t survive in a real forest; they starve to death or are eaten by predators, according to the House Rabbit Society. A predator-free city park with human feeders can be another story. 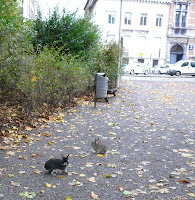 Some of the rabbits I saw in Antwerp were babies–too cute to have been dumped. So I think they’re successful enough to breed. People who dump pets are hard to catch–unless the cities start requiring microchips in rabbits, which could quickly put an end to the problem. What’s odd is that there’s been little effort to introduce natural predators. That’s admittedly difficult in a city park. But fox and rabbits are the classic population cycle relationship biologists have been using for decades. English pest control agents are using ferrets to chase them out of holes. If there are any natural predators out there, they’re likely to start surging on their own with this healthy diet. Is the Jaguar the next "experimental, non-essential" endangered species? 1 comment to A Scourge of Bunny Rabbits?